It’s been a little over a month since our previous post on the Fermented Cod Liver Oil (FCLO) upheaval. I promised then that we would wait to see how Green Pasture Products (GPP) and the Weston A. 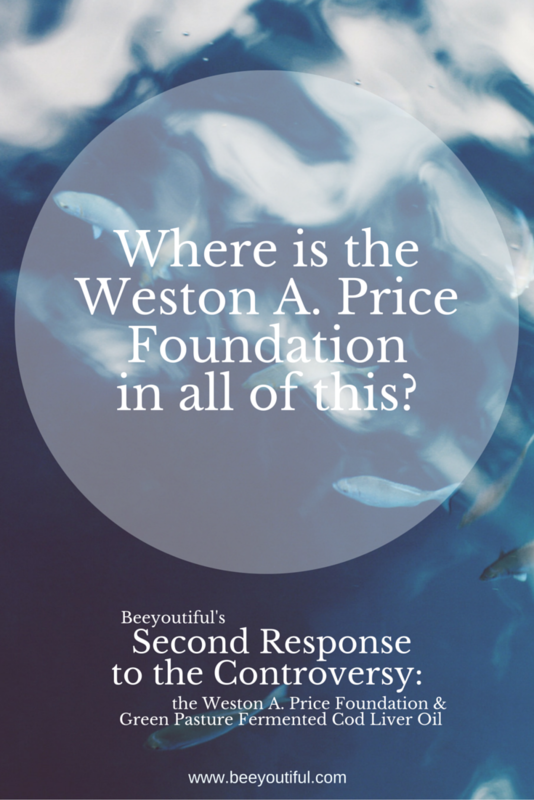 Price Foundation (WAPF) addressed the major issues that have come to light, and then we’d respond again. In the interim, GPP has released quite a bit of information, including laboratory test results. WAPF issued a long Q&A, and some bloggers and researchers connected to WAPF also posted responses. So, it’s time now for our update. I’m going to do this backwards and start with the summary, since some might not want to wade through the nitty-gritty details. If you’re interested in just the highlights and my takeaway, read this section and then scroll on down to the bottom for my conclusion. What’s the source of the trans fats in FCLO? Why is there D2 in an animal product? What about the many reports of health issues that are now coming to light? In my opinion, both GPP and WAPF have acted as though they are more concerned about losing consumer confidence than they are in openly and honestly addressing these and many other issues. We have had a personal membership with WAPF for many years, attending conferences as a participant, a vendor, and a sponsor, and have directed many people to their site for information on healthy living. Sadly, we can no longer recommend the Weston A. Price Foundation as a reliable, trustworthy resource for health advice. And, based on the way they have treated others who have said anything negative about GPP’s fermented cod liver oil, they probably wouldn’t have us as a vendor again anyway. We have seen enough information coming out of WAPF as this situation has unfolded that we know to be untrue, that it calls into question the accuracy of other information that they have published and endorsed. I’m still holding out some hope that out of this turmoil some good changes will come about in GPP and WAPF, and that we might be able to renew these business relationships in the future. My hope wavers, though, when I think that rebuilding trust is going to require a much higher level of honesty and transparency than we’ve seen thus far. I do not mean to imply that everything GPP and WAPF are saying is untrue. Sometimes what is not said is as important, and sometimes more important, than what is said. For example, you might ask someone, “How is that cool car of yours? Is it still running?” And they reply that yes, it purrs like a kitten, and they detailed it just the other day and how wonderful it is to own a car like that. It is easy to infer from this that all is well, nay, even fantastic with the hot car, and that the owner cruises around in it regularly, just feeling the wind in his hair. But that’s not actually what was said. Some pertinent information that wasn’t revealed might be that the tires are bald, the brakes are squishy, and they hydroplaned in it on a rainy day, crashing into a median, bending the axel and tearing off the front quarter panel, and this glorious car isn’t even drivable at the moment. What was actually said is still absolutely true, but at the same time also completely misleading. Both WAPF and GPP have been doing similar things with the information they publish, and have been for years. This is why people believed that the fish in FCLO was Atlantic Cod and that it was sourced from the Atlantic and Arctic regions like most other high quality CLOs. We were led en masse to believe these things, because of both what was and was not communicated by GPP and WAPF, even though they never said these things specifically. There is now evidence that they knew this is what people were believing and they did nothing to correct these misconceptions. For Beeyoutiful to have a relationship with WAPF and GPP in the future, we must feel confident that it won’t require reading between the lines to figure out what’s not being said in order to have a correct understanding of where a product is sourced, how it’s made, and what ingredients it contains. 1) Question: Does Green Pasture FCLO contain the levels of vitamins claimed in their literature? Update: “Probably not” still seems accurate, based on the updated information that we have. GPP did post information that one scientist said that the only way to properly measure Vitamin D is to do a rat bioassay. (Feed the rats the product in question, then kill the rats and test the tissue and blood for the component that interests you.) GPP also posted a rat bioassay from 2009 that apparently showed good levels of vitamin D.
Other information has come out, though, that indicates that taking FCLO does not raise blood serum Vitamin D levels in some people, and at least one person reported that it actually suppressed the level. This is something that WAPF said bears further investigation. 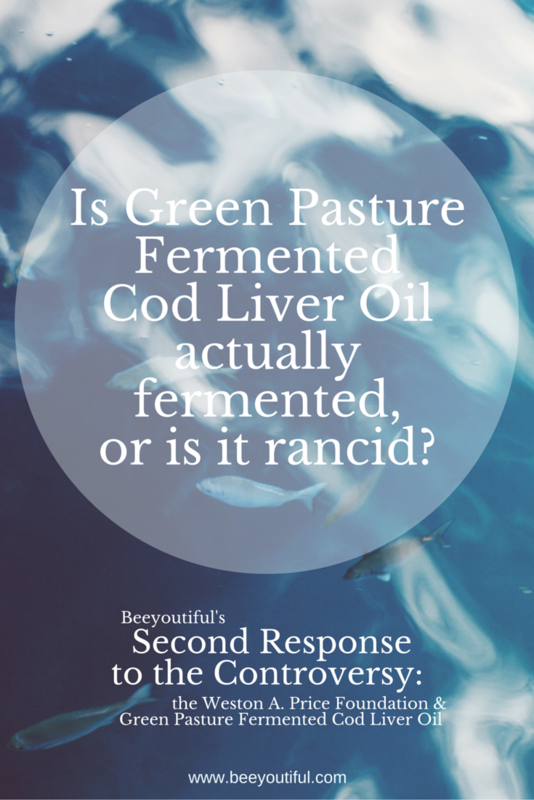 2) Question: Is Green Pasture FCLO actually fermented, or is it rancid? Answer: One of the questions that has arisen out of this controversy is a simple one: can meat be fermented? This person, who seems to know a bit about fermenting, says no, but that it can be cured. So, is the cod liver oil fermented? Is it putrefied? Is it both? I don’t know. Short of having a whole panel of fermentation experts intimately review the entire process, I’m not sure we’ll ever know. I seriously doubt GPP is willing to open up their entire process to that level of scrutiny. I cannot find any information that specifically says that hydrolytic or microbial rancidity can result in anything other than bad odor. It is readily apparent to me that the product is rancid, almost certainly experiencing hydrolytic rancidity, and maybe microbial. The scientists that GPP and WAPF have trotted out have been very careful to speak only about oxidation and to say that the product is low in primary and secondary indicators of oxidation. Not one of them has said that the product is not rancid, although GPP and WAPF themselves have both stated unequivocally that FCLO it is not rancid. 3) Question: Is Green Pasture FCLO safe to use? Answer: Most people think this hinges on the issue of rancidity. As stated before, the product does not have the markers of oxidation and does not seem to contain toxic byproducts of oxidation. I can’t find any information that says that hydrolytic or microbial rancidity are dangerous in and of themselves, but they seem to usually go hand in hand with oxidation, so there really isn’t much information on them alone. However, there have been rumors and reports of people not doing well while using FCLO. There have been claims of heart conditions, including heart failure, that have cleared up after stopping daily FCLO supplementation. I have seen at least one person whose CRP (a blood test for inflammation in the body) numbers went down significantly after one month of no FCLO, when they had stayed at a steady elevated level for the previous 5-6 years while on the FCLO. There are numerous reports from people that say that they couldn’t tolerate the FCLO, but they did fine on other non-fermented cod liver oils. There are reports of burning throats when taking the FCLO, with one person reporting that it was like her throat was on fire. And then there is the issue of trans fats. Trans fats are not “generally recognized as safe” by the FDA, and manufacturers have until 2018 to get them out of foods (or get an exception). Trans fats are believed to be one of the biggest contributors to heart disease. GPP posted a number of test results recently and most of them had trans fats levels near or above 1%. One of the tests from the report from Dr. Kaayla Daniel showed levels over 3%. This is a huge problem because in the real food movement, trans fats are a huge no-no, no matter the amount. If it has detectable levels of trans fats, it is simply not considered a good product. Trans fats are a problem about which GPP and WAPF have remained very quiet. Now, there are things that aren’t good that we eat in our diets all the time and our bodies filter them out. I’m sure the same would be true of trans fats in small amounts. The problem now is that it is in high quantities in many foods, and the effect of trans fats is cumulative. Dr. Weston A. Price warned decades ago that cod liver oil had some toxins in it, and to use it in small amounts. He also said that because of the synergistic effects of using it with high vitamin butter oil, the same effects could be achieved with much smaller doses. Green Pasture touts their product as wholly unique and is very up front that “this product is not for everyone”. Whether this unique product is any more dangerous than other CLOs, and the issues listed above are simply from overdosing, I do not know. WAPF basically blamed Dr. Ron’s heart failure on FCLO overdose, implying irresponsibility on his part. That would mean that too much FCLO is dangerous, but how much is too much? For years, WAPF recommended 6-12 times the dosage that GPP now has on its website and labels. Thankfully, those references have now been removed and they are only recommending a dosage a little more than 2 times the GPP recommendation. They still recommend putting FCLO into baby formula and the dosage is very high, because it is based on their previous recommendations and hasn’t been updated. I would recommend not putting any cod liver oil in homemade baby formula, but if you think you need it, I would advocate that you use a different one until more is known about this issue and its safety. It is certainly possible that this unique product may have unique beneficial properties as they say, and it may also be unique in its detrimental properties. Since it is unique, all of the studies that have been done on CLO toxicity, safety, and benefit do not necessarily apply to FCLO. I think the takeaway from all of this is that Cod Liver Oil, in any form, is not a whole and complete food. It is an extracted, highly concentrated product, and it should be used with care, perhaps treated as carefully as a medicine (which seems to be how Dr. Price employed it). 4) Question: Is Green Pastures FCLO diluted with a vegetable oil? Answer: I have not been able to confirm yes or no. A very prominent marine oil scientist thinks that it is. Initially, I thought that the trans fats present in that one test by Dr. Daniel were compelling evidence as to the presence of a vegetable oil, but that it could have been just one batch. Now we see that there are levels of trans fats in all recently tested batches. Chris Masterjohn in his response said that dilution with a veggie oil was certainly the easiest explanation, but that it could also be a result of microbial activity. Since GPP are “fermenting” and “adding a starter”, you would definitely think there would be microbial activity, but there is not evidence pointing to that as a source. David Wetzel says that they don’t even have vegetable oil in their kitchen, much less in their plant. He has also said that they don’t use or add vegetable oil in their process. What he has not said is that the trans fats are NOT from vegetable oil. This could be significant, or not. It could be that the cod livers are put in vegetable oil before being frozen. It could be something else in the way that they are handled before they even get to GPP. Or there could be no vegetable oil at all, from catch to bottle, and the trans fats are from something else entirely. Without more transparency, it’s simply impossible for us to know. If the trans fats are coming from a veggie oil, that is something that can probably be fixed in GPP’s production process. That some microbial activity could be creating a harmful substance is not a happy thought, and I don’t know how they could fix that. 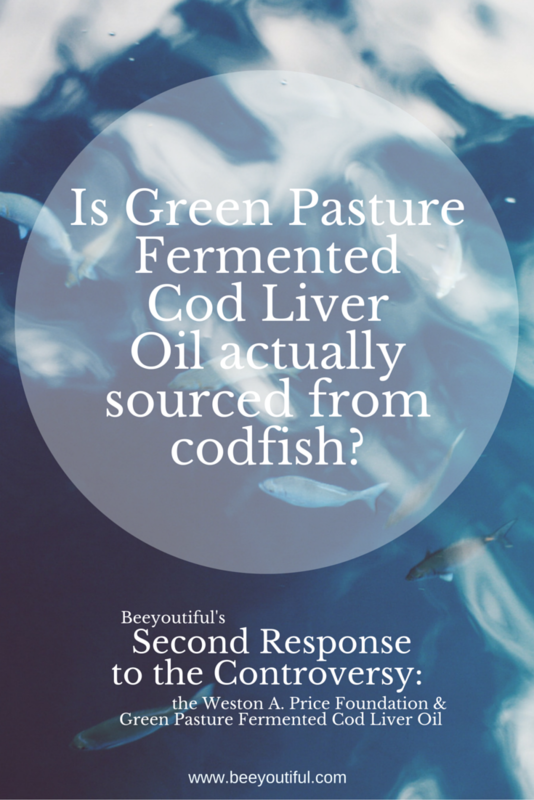 5) Question: Is Green Pasture FCLO actually from cod livers? Answer: “Yes.” And “No.” And “Yes” again. And “No” again. I’ll explain. First it was reported by people close to GPP that they “only” used 10% Pollock livers, and that they would have put that on the label if only they had been asked or had known that it was important to people. Then, WAPF said in their Q&A that GPP “uses mostly Pacific Cod but also some Alaskan Pollock”. It took more than a month before we heard from GPP that in the past they have used Pollock, but this season they are using Pacific Cod. They did not mention a quantity of Pollock or whether it was seasonal, whether all batches were a certain percentage, or some a high percentage and some low or none. 6) Question: What about the High Vitamin Butter Oil? Answer: There has been no update on HVBO from GPP. It has not been mentioned. No mention of rancidity or not, no testing of it, no mention of sourcing or handling. Nothing. We did get confirmation from WAPF of it being sourced from Argentina, but no other information and no response directly from GPP. The last references of “Great Plains” sourcing were also removed from the GPP website. 7) Question: Where is the WAPF in all of this? Answer: Here, to me, is the saddest part about this whole giant mess: WAPF seems incapable of objectivity with regards to Green Pasture Products. Some have speculated that this is so because of some secret financial arrangement or a family tie. I don’t think so, but the truth is that there is a special relationship between WAPF and GPP that does not exist with any other vendor. Whether it’s nepotism, cronyism, or some other “-ism”, there is something going on there besides just the vendor-organization relationship that WAPF has tried to present. They have said they would act the same way with any other vendor, yet, they have actually behaved in opposite ways to other vendors of cod liver oil products in the past. There are numerous articles written by David Wetzel and others on the WAPF website that are solely for the promotion of Green Pasture Products. No other vendor has enjoyed that benefit. WAPF is acting as though they are a marketing and PR firm for Green Pasture products, and has for years. They could not be working for them any harder if they were paid to do it. As WAPF members and vendors, we expected them to be the gatekeepers, to research and review and thoroughly vet products for us in an objective manner. And they appear to have no capacity to be impartial when it comes to Green Pasture Products. Instead, they have banned a vendor and featured speaker at their conferences who attributed his heart failure to FCLO. They say this is their policy, and it has been enforced before, but only ever in regards to GPP, to my knowledge. We’ve even heard that The Weston A. Price Foundation is threatening to expel local chapter leaders for saying anything negative about Green Pasture Products. Reportedly, they are coaching chapter leaders in how to talk their concerned members through this GPP issue. They are patrolling WAPF-branded Facebook chapter sites and demanding that links to anything but pro-GPP info be removed, and threatening lawsuits if they are not removed. They have canceled the Santa Cruz chapter for linking to a blog that is reporting the other side of the story. They are removing chapter leaders from their private Yahoo group if they say anything negative about GPP, question GPP, or question the way that this situation is being handled. WAPF has completely lost its objectivity and integrity in how it is handling this situation. 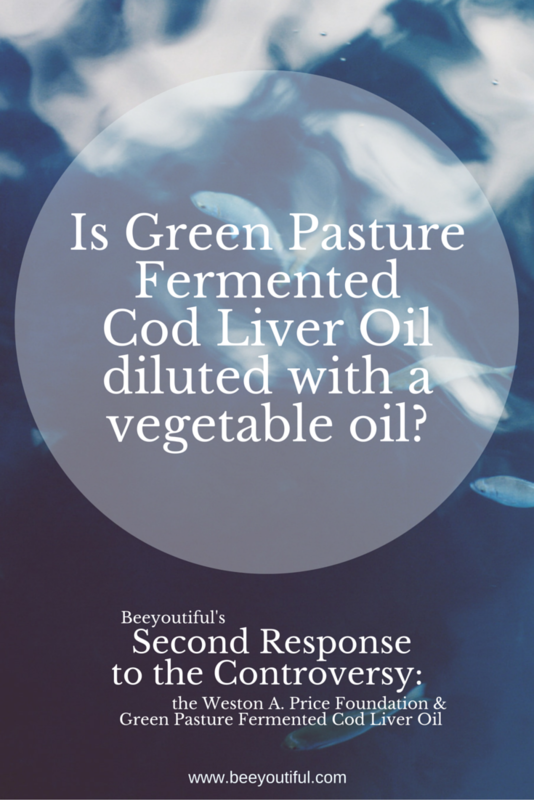 “When David Wetzel, the owner of Green Pasture, first began making the fermented cod liver oil, he sent it to NDI laboratories in Canada (associated with Guelph University) for Vitamin D testing. He was surprised when these tests came back showing Vitamin D2, with very little or no D3. Mr. Wetzel immediately communicated this to us. He then sent the oil to the University of Wisconsin for a rat assay test to see whether the oil had Vitamin D activity—and the answer came back yes. Mr. Wetzel has shared all this on his website. The rat assay is considered the gold standard of Vitamin D testing. The University of Wisconsin then recommended UBE Laboratories in Fullerton, California for further testing, and these labs found mostly Vitamin D2 as well. So, to recap, GPP was expecting D3 in the product. They found only D2 so this was reported to WAPF immediately because it was unexpected. They sent it to another lab, just to confirm that it was really D2 in the product, and it was. Nobody has said that D2 is not effective, just that it is not as effective as D3, and that it can be toxic. Natural D2 is found in plants. Natural D3 is found in animals. Cod liver does not have significant D2, but is high in D3. And good CLO that doesn’t strip out vitamins and add them back in or add back synthetic vitamins also has D3. Tests showed that GPP has D2. There are two possibilities I can think of. The fermentation process is converting D2 to D3. The lab results were wrong. Twice. Sending to a marine biology/chemistry lab to triple-check seems like a no-brainer, but it wasn’t done. Why not? Considering all of the research on D2 vs D3, and WAPF’s acceptance of all of that information (one would assume after examining the studies, their methods, and conclusions), and perpetuation of that information, we should find it interesting that they were willing to abandon it all because D2 was found in FCLO. This was at the beginning, when FCLO was first made. There was no research, no studies, no anecdotal evidence, no human trials or testimonials. There was nothing. Yet, because D2 was shown to be in this product, they completely changed their minds about D2’s value. On the one hand, there is decades of research into vitamins with tons of studies by reputable scientists. On the other hand, a guy uses an ancient putrefaction method for cod liver oil extraction, adds some bacteria to the process, and calls it fermented. Now suddenly, oh, D2 isn’t so bad! (WHAT?!) They determined in their minds beforehand that FCLO was best and therefore anything CONTAINED in FCLO was best, and they were and are willing to abandon actual research, ignore health complaints, put the best possible spin on test results, bury information, make up new narratives, put out false information, fail to disclose negative test results, suppress free discussion of the issue in their circles, and to the extent that they can, punish anybody that counters (or even just questions!) this PR campaign. WAPF is the organization that we were trusting to give us good information about health and food. That’s not to say that they haven’t put out good information. The problem now is that we have to sift through that information and question all​ of it, because we don’t know what’s legitimately good and what’s been compromised by some preconceived ideology. It seems reasonable to me to expect that when WAPF drastically lowered their recommended daily dosage of FCLO, they would have announced it. I mean, why would they change it? More FCLO means more nutrients, right? So taking more is good, right? But they did change it, and changed it to a much lower dosage. Can you think of any reason that they would do this other than health concerns, that perhaps too much might be toxic? I cannot. And if that is the case, then wouldn’t it be responsible to announce that you are lowering your recommendations so that people could lower their dosages? Unless, of course, people started asking questions and you had to explain that you were doing so over toxicity concerns, but that would certainly undermine public trust in the product. And it’s interesting to me that the WAPF didn’t just change the dosage. They are acting like they never ever recommended any OTHER dosage, and that anybody that took “too much” was not following their recommendations. I can only think that they are trying to protect GPP and themselves from litigation, protect GPP sales, and perhaps there is an element of pride involved as well. There is a lot more, but it makes me weary just to think about writing even more about it, so what I’ve covered here will suffice. Except for this all-important thing that I need to say. At Beeyoutiful, we’re completely committed to being a full disclosure company. If we know an ingredient is in the product, we put it on the label. Period. We have an established process that we put any companies and products through before we use or carry them, and one of the steps of this process is to verify that they too are full disclosure. I feel like we were misled and fooled, but that’s on us. We should have done more research. We should have asked more questions. Regardless of how this situation eventually turns out, or what facts come to light, we endorsed both the company and products without adequate research. We didn’t know sourcing. We didn’t know vitamin content. We didn’t know a lot of things. I’m so sorry. We messed up. I can imagine some reading this might feel disappointed in us. Indeed, we’re disappointed in ourselves. We have definitely learned a painful, yet valuable lesson through this. I hope you can find it in your hearts to forgive us. Please post your comments or questions below, and I will try to address them to the best of my abilities. 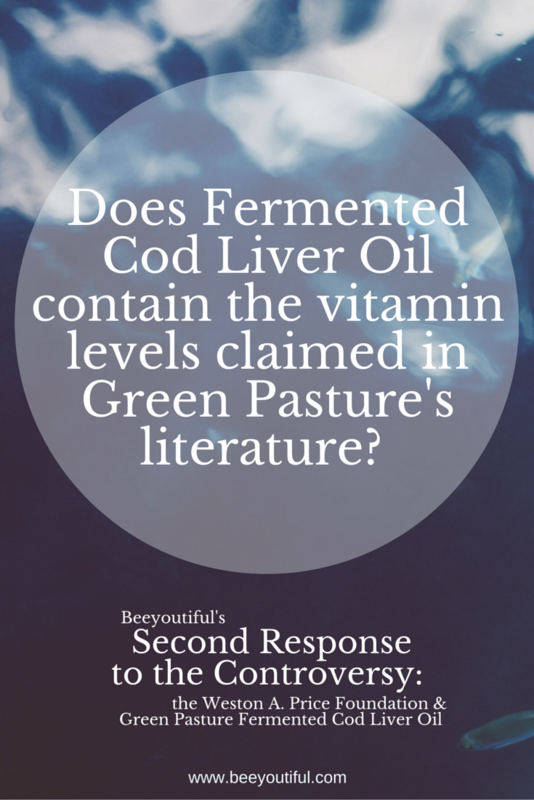 So, maybe you’ve heard the big controversy that recently broke in the real food community about fermented cod liver oil. If you’ve missed it, here’s a summary. 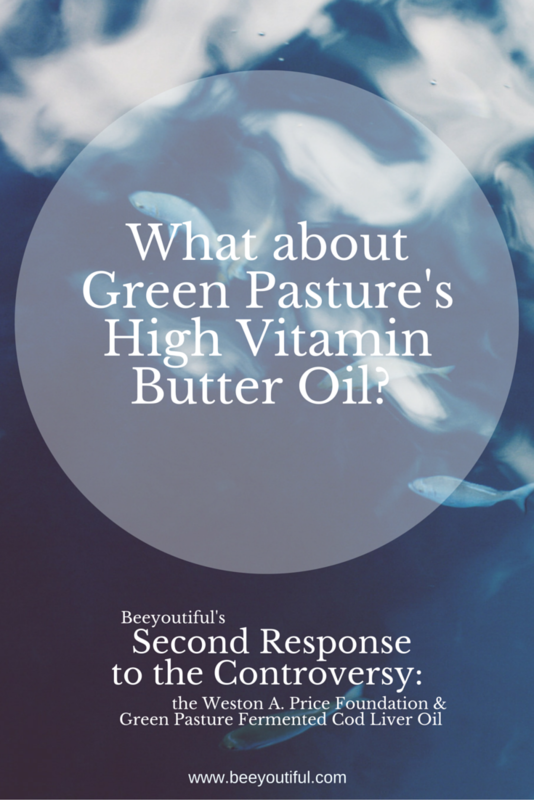 Green Pasture is a company in Nebraska that makes fermented cod liver oil (FCLO) and high vitamin butter oil (HVBO) products. This company has been HEAVILY promoted by the renowned Weston A. 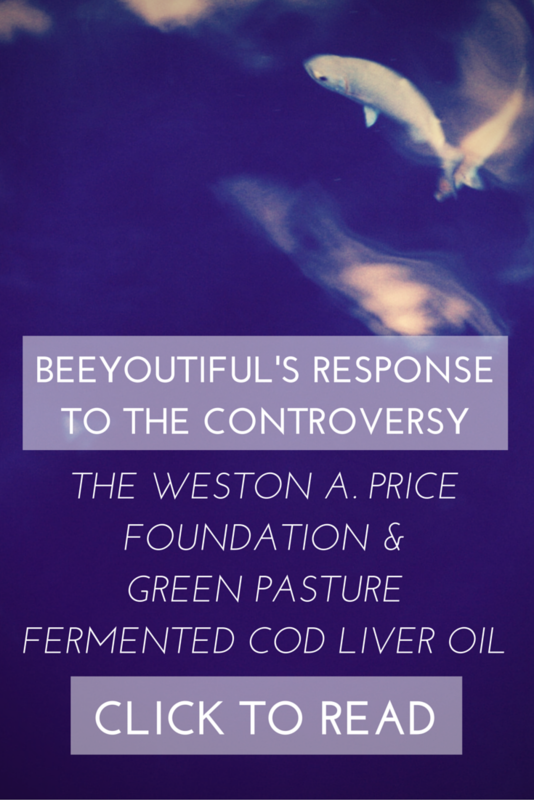 Price Foundation (WAPF), which claims that the Green Pasture FCLO is the best cod liver oil available and recommends it for everybody of all ages. The Vice President of WAPF, Kaayla Daniel, PhD, has independently published what amounts to an exposé on the Green Pasture FCLO. She asserts that Green Pasture products are rancid rather than fermented, and that perhaps they aren’t even sourced from codfish. Here are three blog posts that are excerpts from Daniel’s report. If you want the full report including original test results, you might be able to access it here, or you might have to do what I did and follow the link from one of the above articles and give name and email address to download it. David Wetzel, the owner of Green Pasture, has responded to some of Daniel’s challenges in a blog post. Since we carry Green Pasture FCLO, we have been asked by multiple customers about what’s going on, and to share our opinion. After many hours researching this, I think there are several issues worth considering. 1) Does Green Pasture FCLO contain the levels of vitamins claimed in their literature? Well, it seems like probably not. In his rebuttal blog post, Wetzel didn’t even argue that point. However, he said that the amount of vitamins is less important than the bio-activity of the vitamins. He says their bio-activity is very high. Maybe he is right. It would be hard to know for certain, unless they are also having other CLOs tested at the same time, in the same manner, and releasing all of the test results to compare them side by side. Regardless, leading people to believe that there are certain levels and then under-delivering is at the very least a poor practice. 2) Is Green Pasture FCLO actually fermented, or is it rancid? Oil cannot be fermented. So the oil itself is not actually fermented. This is not in contention. What is in contention is whether the cod livers are fermented, or whether they have gone rancid and putrid. “Fermenting” a fish would present the same problems as fermenting a fish liver, as there are few carbohydrates, and certainly not enough to allow it to ferment for months or even a full year. I didn’t know anything about the process of making fermented fish sauce, so I did a little research. And the research said exactly what Wetzel said, that it involves leaving the fish parts in a barrel of salty water out in the sun for up to year. So it is quite possible that the process he’s describing is viable to make a good product, I don’t really know. It might not be “fermentation” or more specifically “lacto-fermentation” as we commonly know it, but fermentation may be the closest descriptor we have. However, it was pointed out to me that polyunsaturated omega fatty acids go rancid quickly when exposed to oxygen and there are much higher levels in cod liver oil than in fish sauce so a greater susceptibility. Another page advised, “Look for fish sauce with a clear, reddish brown color, like the color of good whisky or sherry, without any sediments. If the color is a dark or muddy brown, the sauce is likely to be either a lower grade, or one that is not properly or naturally fermented; it may also have been sitting on the shelf a bit too long. Good fish sauce also has a pleasant aroma of the sea, not an overwhelming smelly fishiness, and should not be overly salty.” Other sites agreed with these: clear reddish fluid was good, darker with any sediment was poor quality. Anybody that has tried FCLO knows that it doesn’t just have a strong odor. It stinks. It is foul. And every one that I have tried was a very dark color. But does that mean it is rancid? Some of the test results that Dr. Daniel published in her report have markers called free fatty acids that indicate rancidity. Some of the other markers of rancidity are “early markers” which dissipate as the product becomes progressively more rancid. The Green Pasture FCLO products show either low or undetectable levels of these early markers in all of the test results I’ve seen. However, all of them, even the ones that Wetzel and WAPF say clearly indicate there are no signs of rancidity, contain these free fatty acids. Wetzel says that free fatty acids are a natural process that occurs in the body, and so they are perfectly safe. As far as I can tell, he is correct in the first assertion, but there are several studies that link free fatty acids to insulin resistance and other complications. I’m of the opinion that fish livers, and specifically cod livers CAN be fermented in the same manner as fish sauce to make a good, safe product. It would seem that Green Pasture may have a problem in their process, either the fermenting of it, or the extracting or cleaning of the oil. 3) Is Green Pasture FCLO safe to use? It is commonly believed that eating anything rancid is not good for you. It might not kill you, but there are things in rancid products that just aren’t beneficial to healthy living. It’s the same with rotten products. Some people claim there are health benefits to eating rotten things. I don’t know about that. I do know that rotten stuff is “blech” as my 2 and 3 year old sons would say. Wetzel said they just passed a 4-year food safety test. I don’t know what that means and he didn’t elaborate. If it means that it is tested for botulism or a similar food poisoning bacteria like they would on canned foods, well of course it wouldn’t have that (for the same reason that oil cannot ferment: no carbs). What’s more is that trans fats were found in the FCLO in a not insignificant amount of 3.22% in one of the lab findings. Trans fats are not “generally recognized as safe” by the FDA, and manufacturers have until 2018 to get them out of foods (or get an exception). Trans fats are believed to be one of the biggest contributors to heart disease. Dr. Ron, of Dr. Ron’s Ultra Pure, has some serious concerns about fermented cod liver oil, but his problem might have resulted from any kind of cod liver oil, not specifically the fermented kind. 4) Is Green Pastures FCLO diluted with a vegetable oil? At least one of the test results Dr. Daniel reported is difficult if not impossible to explain if the product is NOT diluted. Interestingly, this is something that Wetzel didn’t address in his rebuttal. Perhaps he doesn’t have a good answer (either he didn’t/doesn’t know what is happening up the supply line, or doesn’t have a favorable way of presenting it and so he’s going to leave it alone), or perhaps he doesn’t consider this to be much of a problem. For me, this is a HUGE issue. If you’re buying a premium product, you expect it to BE a premium product, and not diluted with something cheap. The fact that the report indicates it was a heat-damaged vegetable oil, and according to Wetzel there is no heat used in their process, means an added oil was heated before it got into his product, or that the product is getting too hot during the process in spite of their no heat policy. 5) Is Green Pasture FCLO actually from cod livers? This is another big concern of ours, as we are committed to remaining a full disclosure company. We want to know every ingredient in every product we sell. Apparently the fish being used is Alaska Pollock, which has recently (Jan. 2014) been reclassified as being part of the same genus as cod, meaning, according to scientists, that it is a close relative. It is a very cheap fish (about 1/3 the cost of Atlantic Cod, according to one person) and very commonly used for fish sticks and the like. But to my mind, if somebody thinks they are buying premium Norwegian Cod (which Green Pasture never states, but has definitely led people to believe with their rhetoric and even certain product names), and instead you’re giving them cheap “in the same family as cod” while continuing to charge them a premium price, that’s a problem. That’s a BIG problem. Again, this is another area that Wetzel didn’t address at all in his rebuttal. I can’t wait to hear what he has to say. Further research into this shows that while the changing of the scientific name may render this fish “a cod”, NOAA has determined that it still should be labeled Alaska Pollock and that it’s incorrect to label it cod. As of March 2015, requests to the FDA to be able to label it cod were still under review. A look at the FDA’s seafood list shows the only acceptable market names for this fish are “Pollock or Alaska Pollock”. We are a full disclosure company and see this sort of thing as unethical, and because of FDA labeling laws, it might actually be illegal. A couple of years ago, Green Pasture was having really bad sourcing problems. They just couldn’t keep up with demand. They were out of stock a lot and when they did have stock, we were severely limited on how many FCLO products we could buy. I can’t help but wonder if at that time, a man had to make a difficult decision to try to keep his business going, and that’s how we arrived at this point. 6) What about the High Vitamin Butter Oil? This shows signs of rancidity as well. Wetzel has reported at other times that the butter oil would have a strong fermented flavor. Since HVBO doesn’t even CLAIM to be a fermented product, one would wonder why that would be the case, unless it wasn’t being handled properly. The other issue addressed by Daniel is one of reported sourcing. Apparently Green Pasture changed their sourcing from “northern great plains” and changed most of their product descriptions to remove that reference, but as of 10 days ago, at least one of their descriptions still said this. That has since been cleaned up, but they didn’t notify any of their resellers, and so those sites still carry the “great plains” sourcing description. The new source is reportedly Argentinian, and appears to be quite good, containing no antibiotics, with high vitamin content, and no GMOs. And I can give somebody a pass for missing a detail on a product description and even failing to inform resellers about changes. We certainly don’t notify resellers every time we change a product description, and we regularly find out of date information on product descriptions. Still, it seems to fit into a pattern or projecting an image that isn’t true and being mum about actual sourcing. 7) Where is the WAPF in all of this? 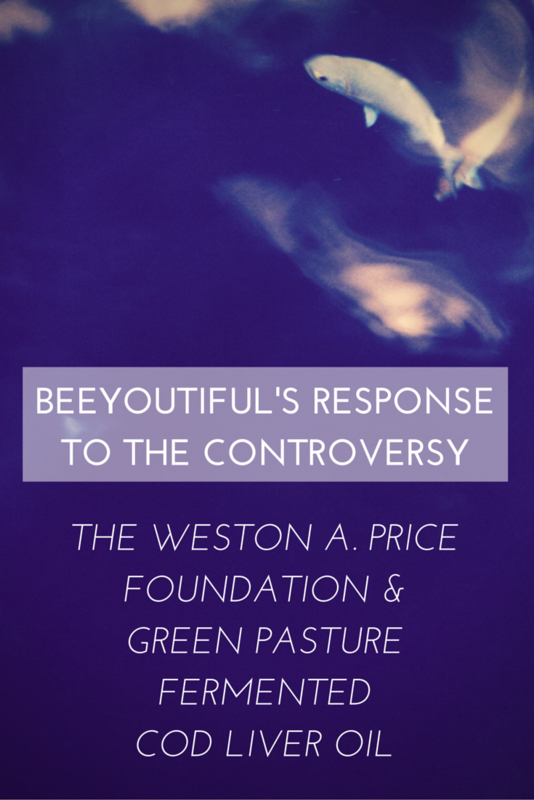 There is kind of an incestuous relationship between Green Pasture and Weston A Price Foundation. Green Pasture ALWAYS gets premium billing and lots and LOTS of exposure from WAPF, over and above other companies that would seem to be on a par with Green Pasture in mission and quality. This is all free advertising for Green Pasture that’s worth literally hundreds of thousands of dollars, perhaps even millions over the 9 years this product has been held up by WAPF as the gold standard. Green Pasture then pays for advertising in WAPF journals, pays for the super premium sponsorship at the WAPF conferences, and sponsors other giveaways and promotional efforts. So you wouldn’t expect WAPF to just throw Green Pasture under the bus, due to the relationship, but also due to very practical matters of finance. However, by WAPF’s statement, they do not seem to be looking for the truth in this matter, but looking for a way to quickly make this all go away. The WAPF has issued a statement in support of Green Pasture and is planning to issue another much fuller statement after reviewing Dr. Daniel’s report further. I suspect that it too will be in support of Green Pasture. WAPF released test results in February that seem to indicate no rancidity. The date on the test is in December though. The timing of the release of the test results is curious, as is their use of a UK lab, but both could have reasonable explanations. However, it was only one test from one lab, testing only for rancidity, and I have reason to believe it was in conjunction with Green Pasture, and not just a random bottle off of a shelf. A quick search of “oil oxidation” brought back this description: “Oil oxidation is an undesirable series of chemical reactions involving oxygen that degrades the quality of an oil. Oxidation eventually produces rancidity in oil, with accompanying off flavours and smells.” Anybody that has tried Green Pasture fermented cod liver oil can testify to “off flavours and smells”. This is a great big mess. I feel like WAPF and Green Pasture did not listen to valid concerns, for whatever reasons, and that led to Daniel “going undercover” to do this investigation. Green Pasture has a monetary interest in discrediting this report. WAPF has hitched their wagon to Green Pasture and would lose face and a lot of sponsorship dollars if Green Pasture suffers from a loss of consumer confidence. And Daniel is using this to build her email list, which in the world of information marketing means generating more leads, and getting more business. Every player seems to have reputation and money at stake, and it is hard to feel like you are getting truly unbiased information from the players when that is that case. I will say that despite what some might think at this point, Wetzel seems not entirely without integrity. There are a lot of areas where it seems he has done things that we feel might be unethical, but as far as I can tell, Green Pasture hasn’t actually said anything that is untrue, or at least I can say that it seems they believe that what they say is true. It seems they may have left out information, been vague about some things, and allowed misinformation that was favorable to continue to be rehearsed by others without correcting them when they could have, but they haven’t knowingly lied that I can tell. And I don’t think there is necessarily malice involved. I think Wetzel and Green Pasture believe that they are providing a fantastic product, and that increasing the spread of the product is in everyone’s best interest. However, I also know from personal experience that when there is a lot of money on the line, it is easy to talk yourself into believing all sorts of things, and it can be a slippery slope. Being out of stock on a single signature product (or having consumers lose faith in the product) can seriously hurt a business, and when that product makes up a HUGE percentage of your business, it can be crippling. Believe me, it is hard to see people out there cutting corners and not be tempted to dip your own toe in. For years, we routinely recommended FCLO for people who were trying to heal from major illnesses or conditions. That has changed as we’ve had concerns ourselves about FCLO for a couple of years. Due to our concerns over the years, we have tried adding on a number of different cod liver oil products, and were grateful to be able to add Rosita Extra Virgin Cod Liver Oil as a really great alternative to Green Pasture products. It is super high quality, and their ratfish oil is even more nutrient dense. The prices coincide with the quality. We also added an excellent extra virgin butter oil from Organic 3 that is very fresh tasting. We’ve been recommending Rosita oils instead of the FCLO products for some time now. 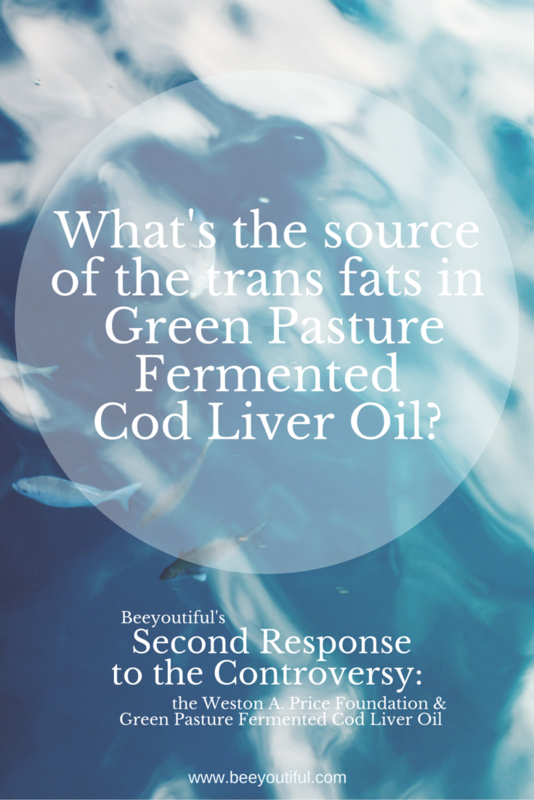 We continued carrying the Green Pasture FCLO products, as we have many customers that want them and because we still believe there is some value in them, just as we believe there is some value in just about any CLO you can find regardless of how it was processed (assuming it really is cod liver oil!). But we’re not happy with the responses we’re hearing. Wetzel says he has lawyers going over Dr. Daniel’s report. Not scientists, chemists, biologists, or other experts in processing or whatever, but lawyers. He hasn’t offered to launch his own investigation into his supply chain or review his processes. He isn’t forthcoming with sourcing information that might quickly dispel some of these claims. That doesn’t seem like an attempt to get at the truth. Unfortunately, “It’s safe, we promise, take our word for it and keep buying!” just isn’t going to cut it for us at this point. I would have expected an organization like WAPF to respond with something like, “Wow, these are serious claims that we need to investigate.” But, that hasn’t been the case. As far as I can tell, they, like Wetzel, are not planning to investigate the product, or process, or sourcing, but instead to investigate the claims and the test results. They seem to be circling the wagons in full support of Green Pasture. At this point it kinda has the look and feel that what we will get from them in the coming days is an attempt to discredit the report, or the author, to explain away findings, and to sweep the whole affair under the rug. They have said they will release another statement soon, and we’re waiting to see what they say. These are not the responses that we’ve wanted to see. We are a full-disclosure company, and trusted Green Pasture because of WAPF’s endorsement. Now it seems that our faith may have been misplaced. We don’t want to be associated with this. 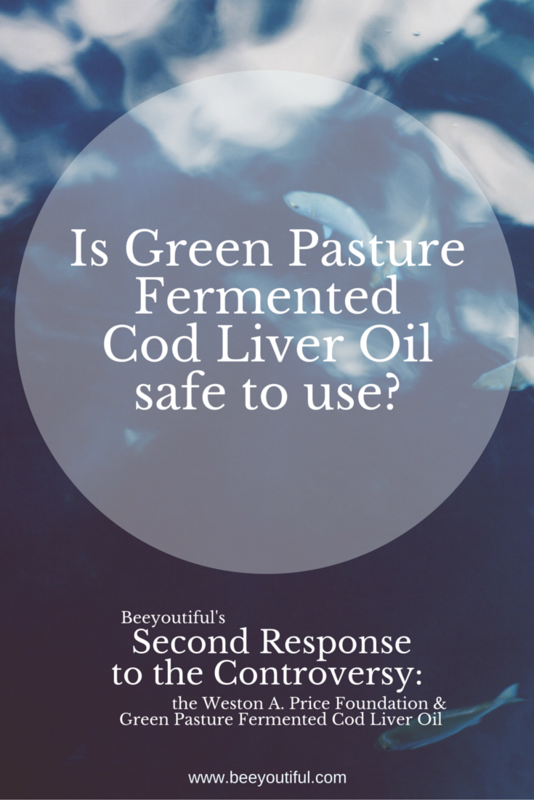 We will not be recommending Green Pasture Fermented Cod Liver Oil products. We will continue selling the product while awaiting the promised further responses from both Wetzel and WAPF, but won’t reorder for the time being. Depending on how things shake out over the next couple of weeks, we may indeed stop carrying the product altogether. We’ll see how WAPF and Green Pasture address our concerns in their point by point response to this report. We’re interested in your opinions too. Please leave us a comment and let us know what you think, and feel free to ask us any questions that might be on your mind, and READ OUR SECOND UPDATE HERE. While cradle cap does not affect the health of the baby, it can be something that is unsightly and it’s usually a sign of underlying health and nutrition needs. While the underlying factors are not entirely understood, we do know that there is a connection between the hormone levels in the mother and a topical yeast or fungal infection that can affect the baby. Thankfully, there are some wonderful and natural ways we can work to help eliminate cradle cap. The emphasis on having sufficient Omega fatty acids has increased in the last several decades. Maternal supplies play a huge role, and it’s highly encouraged to take either Cod Liver Oil or Omega 3‘s while breastfeeding a young infant. Older infants can have Cod Liver Oil or Omega 3’s added to their own diets once they have begun solids. Eliminate foods in both mom and baby’s diets that may be contributing to fungal overgrowth. Common triggers include but are not limited to wheat, gluten, dairy, sugar, and soy. Eliminate soaps and other cleansing products; warm water is usually sufficient for baby’s bath. Harsh soaps can strip an infant’s skin of protective natural compounds. 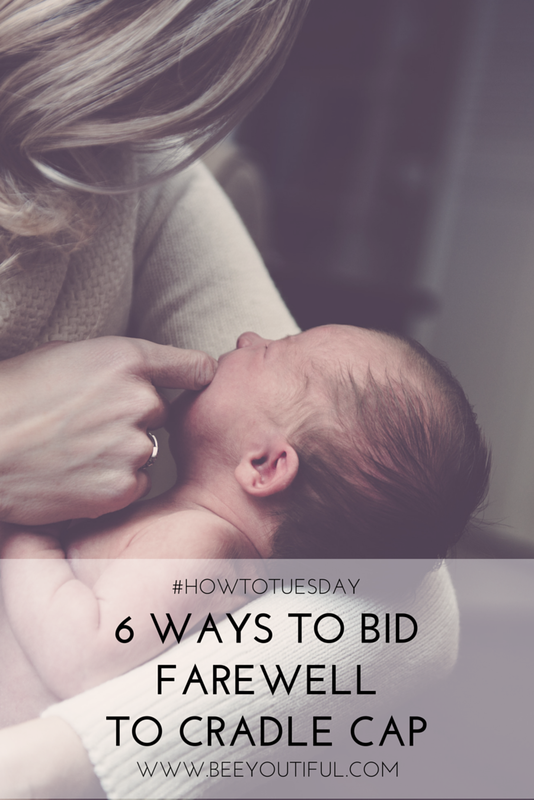 Run a humidifier during dry times of the year to keep baby’s skin from drying out. Gently massage a few drops (you don’t need much!) of Lavender Infused Oil into baby’s scalp. It’s a great way to nourish and moisturize any dry skin. Add the lavender blossoms to a clean mason jar. Cover with olive oil, cap tightly, and place jar in a window for a week. Shake occasionally. Strain out the blossoms, then store the infused oil in a clean glass jar in the fridge. Mix together and rub into the skin a few times a day, or cover well and let sit overnight. Then use a soft brush to gently wash out baby’s hair. Have you found other gentle remedies for cradle cap? Share your experience with other parents by leaving a comment here. We love to learn from our readers! Its summer! And no matter if you are blessed with olive skin that enjoys the kiss of summer or are snow white and must hide from the sun’s rays, it’s important to both protect and nourish the skin when exposed to some of the more damaging aspects of sunshine. Growing up, many of us were cautioned to avoid going out during the hottest parts of the day, to stay in the shade during the most intense times, and enjoy the sun in the morning and evening. While avoiding hot sunshine may help you avoid burns, it may not have been the best advice available! What you probably weren’t told is that damaging UVA rays are prevalent all day long, while beneficial UVB sunlight is best obtained in the midday. UVB light is extremely low in the morning and evening, exactly the times we were encouraged to be outside! So while I was diligent to do my gardening early in the day to avoid the “intense” sun, I was unwittingly exposing myself to the damaging UVA rays while almost completely missing the beneficial UVB rays. Thankfully, I’ve gained more complete knowledge since then. Here’s what I’ve learned about sun exposure. First, there are things we can do to dramatically increase our skin’s health and lower our potential for burns and damage. 1. Build your tolerance by small, increasing increments of barrier-free sun exposure, specifically during the middle of the day. Start with 5-10 minutes (less if you are especially fair) and work your way up daily, adding a few minutes at a time. 2. Use clothing or hats to cover yourself to allow for a barrier; remember that protection is important even on cloudy days, early in the morning, and late in the afternoon. 3. Give your skin a rest with frequent breaks in the shade or indoors. 4. Drink green tea for a plethora of antioxidants that help to protect the skin and body. 5. Take Cod Liver Oil or Omega 3’s. Having a healthy amount of Vitamin D and Omega fats in the body provides natural protection against the sun’s damaging rays. 6. Use a non-toxic sunscreen like Bee Shade! But I got sunburned anyway! There are times when even though we’re the most cautious, we do get a tad pink (or even blazing red!). Our bodies fairly scream at us for relief when this happens. There are some great ways to calm the sting, help restore your skin, and reduce the effects of the sun’s rays. 7. Apply Aloe Vera Gel directly from the plant to the sunburn. This provides both soothing relief and healing support to the skin. 8. Gently massage burned areas with a nourishing oil. 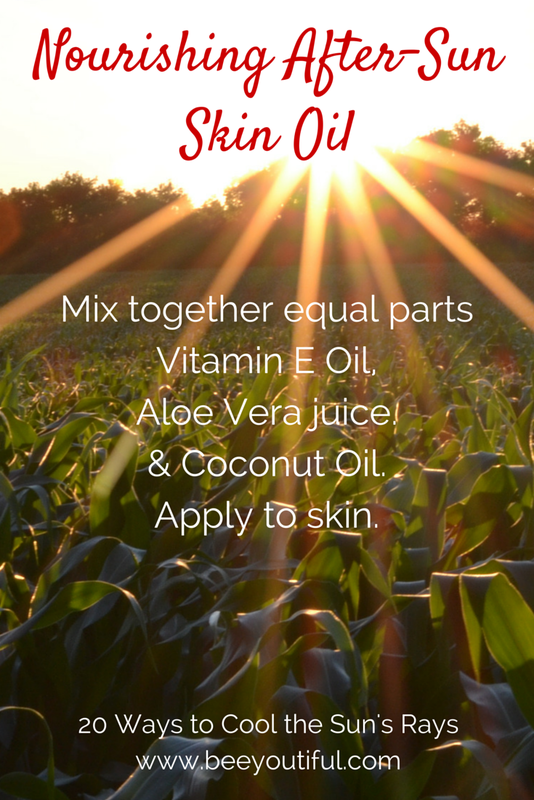 Mix together equal parts Vitamin E Oil, Aloe Vera juice and Coconut Oil. Apply to skin. 9. Make a soothing paste of Bentonite Clay or French Green Clay and apply to the sunburn. A drop of Lavender or Tea Tree Essential Oil can also be added to the mix. 10. Arrowroot Powder can also be made into a paste and applied to the area. You can add a drop of Frankincense or Lavender Essential Oil as well. 11. Slather on some homemade raw yogurt (use the plain unflavored variety, of course!). 12. Fresh plantain leaves can be bruised and then layered on the burn. 13. Lavender Essential Oil can be added to a carrier oil or witch hazel and spritzed on the burned areas. 15. Make a paste of raw shredded potatoes. Apply to the skin and cover to retain the moisture. 16. Keep well hydrated with water, flavored fruit waters, herbal teas and bone broths. All of these provide hydration, along with the nutrients needed to regenerate fresh skin after a burn. 17. Take an oatmeal bath. Place uncooked rolled oats in a tube sock in the bathtub. The oatmeal provides soothing relief. And while you’re in there, skip the soap! It can contribute to dryness, causing further discomfort to already-tight skin. 18. Make your own burn relief spray. Combine in a clean, empty spray bottle and spritz on skin sunburned as needed. NOTE: Cooling Aloe Spray is not considered safe to use while pregnant or nursing. Consider omitting Peppermint and just using Lavender while pregnant or nursing. The Cooling Aloe Spray should NOT be used on children under 10 years old. Consider substituting Spearmint or just using Lavender for children from ages 2-10. 19. Sport some cucumbers! Slice a cucumber into rounds or strips to apply to the burn. Its antioxidant and analgesic properties provide great relief to the burned area. 20. Rest is healing! Try incorporating some topical strategies while lying in a dark room with cool air. What are your favorite ways to protect your skin from the sun, or to heal from over-exposure? Can you add to our list? We’d love to know! Share your thoughts in the comments below. This article by Tal Ewing originally appeared in our Spring 2014 catalog. When you suffer from seasonal allergies like I do, you only want one thing: relief! You want your nose to stop running, your eyes to stop itching, and your throat to stop burning. You want to be able to go outside without having to take a pill or squirt something up your nose that you know is probably not good for you in the long run. But how can you get to a point in your life where you can live without the pills and the sprays? For most of my life, I thought that was impossible. I remember my parents giving me spoonfuls of liquid antihistamines and taking every over-the-counter and prescription allergy medicine on the market. I took allergy shots for almost a decade. However, nothing seemed to work long term, and the more medicine I took, the worse my allergies seemed to get. When I first met Steve and Stephanie Tallent, they pretty much knew just one thing about me: Tal has bad seasonal allergies. I’m sure that my wife (the beautiful, wonderful Mary Ewing) had told them stories of my sneezing, hacking, and doctors visits, and that I was the perfect person to test a new elderberry product for them. So, on our first meeting they came bearing a gift of a bottle of what eventually became Berry Well. It was that gift that helped lead me to finding a few natural solutions that have helped me achieve freedom from the pills and sprays. In fact, since that first meeting I have been able to stop all of my allergy medications and find true freedom from my allergies. Here’s how I did it and how you can, too! This is the part that most of us hate to hear, but it is vital. When I finally realized that allergies are all about inflammation, I started to look for those things in my diet that lowered my body’s natural immunity and caused it to overproduce histamines. I grew up eating the Standard American Diet (SAD). We did not know better, so by the time I met Mary, my diet consisted primarily of peanut butter and jelly, coke, and ramen noodles. (Hey, what’s a bachelor on a tight budget going to do?!) But I was also on antibiotics monthly because of it. As we began to clean up our diets, we not only focused on eliminating things such as sugar, processed foods, and additives, but we made sure to also replace nutrients that had been missing. The body can only repair itself if given the correct building blocks, so ensuring adequate intake of healthy fats, proteins, and carbohydrates, as well as nutrient-dense fresh fruit and vegetables, give the body the proper base for health. Eliminating the non-foods or foods that trigger inflammation in the body decreases the likelihood of over-producing histamines. Be sure that you are getting the essential vitamins you need to build a healthy immune system. I finally realized that my allergies were a symptom of my body’s inability to regulate itself. I started listening to my wife, who encouraged me to take a probiotic, since a significant portion of immunity is regulated by the gut. I began with Tummy Tuneup, alternating with Gut Guardian. I also take Digest Best with my meals; Mary tells me this is because enzymes support digestion which in turn decreases the inflammation caused by poorly digested foods. 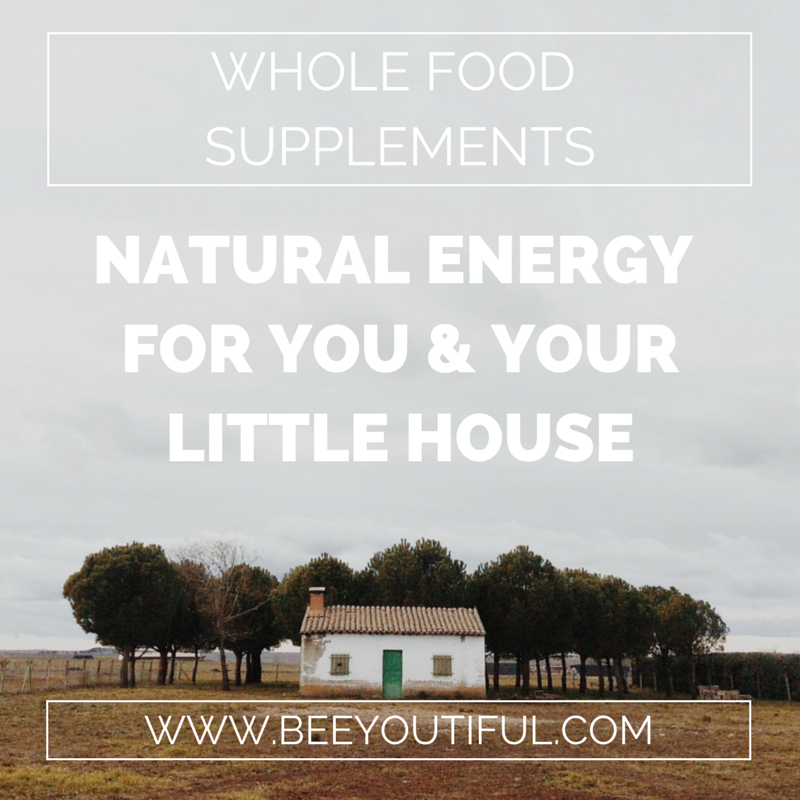 My daily regimen also includes SuperDad, Cod Liver Oil and B-Better to support and fill in the gaps in my diet.I added these to my daily doses of Berry Well, and I began to see a significant decrease in the time I spent dealing with my allergy episodes. This was the basis for my healing regimen, but there are several things that I also use, either when I know I am prone to more symptoms or when I am actually experiencing them. First, I will add Vitamin D3. I usually consume it in two forms, as D3 itself and also in Cod Liver Oil where it is naturally paired with Vitamin A for an added punch. 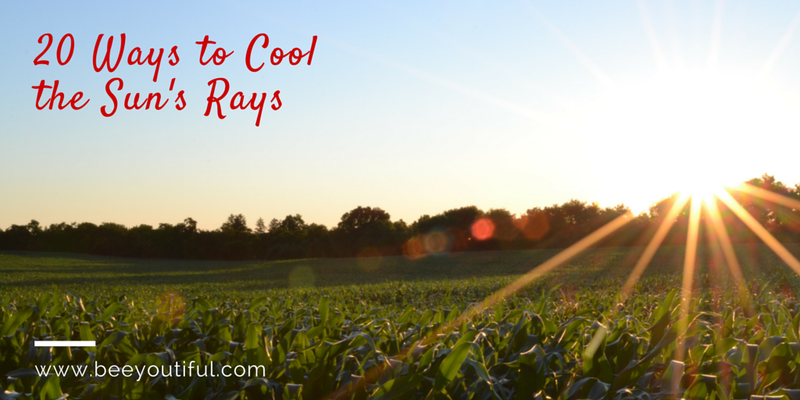 Vitamin D is a natural anti-inflammatory and also works to boost the immune system. Decreasing the levels of inflammation helped to decrease my allergic responses as well. The added benefit of fewer infections also helped keep me out of the doctors office! Although the spring allows for extra sunlight, I would often have to avoid time out of doors due to higher allergens. But as I took my D3, I was able to spend more time out of doors and naturally get my sunlight as well. Then there’s a miracle substance called Colostrum Transfer Factor. Colostrum’s active components not only boost the immune system and help make it difficult for bacteria to attach to the mucous membranes, but they also regulate the immune response. This prevents over-production of some of the lymphocytes and T-cells that cause the allergic responses. So taking Colostrum can keep you from getting sick, and makes sure that allergies are not running wild at the same time. Optimally, we would all have access to raw honey, and pollen too. These help give small exposures to local allergens and gradually decrease the body’s reactions to them. Finding a local beekeeper that has healthy bees and then using a teaspoon of their honey every day can help decrease your allergies. If you do not have access to good quality raw honey, Bee Strong is a great alternative! When I start to feel like I am getting an allergy attack or a cold, I take an extra dose of Berry Well accompanied by a dose of D3 and Vitamin C. This helps my body boost its ability to handle the additional stress of illness. Calm your allergies with essential oils. 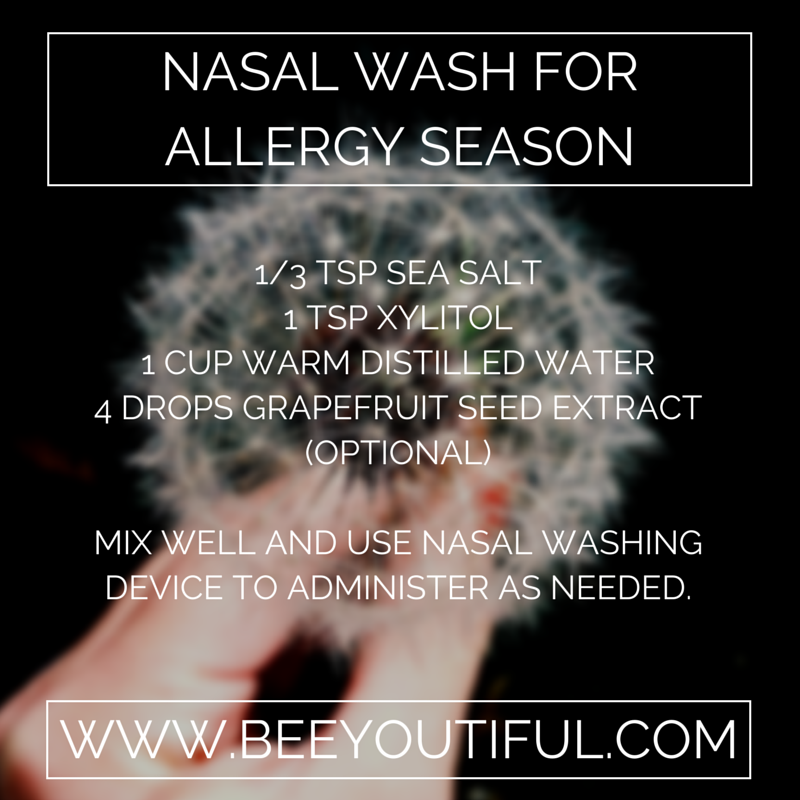 This was the last step I took, but it has been one of the most beneficial in helping me find true allergy relief. If you suffer from allergies, you realize that you cannot always control your environment. Trees are going to pollinate, flowers are going to bloom, and the house is going to need dusting. There is something that you can do, though, to help neutralize those threats to your body: fight them with essential oils. I use a combination of Eucalyptus, Frankincense, and Peppermint essential oils to calm my body when my allergies begin to flare. There have been times when my allergies have led to slight asthmatic symptoms as well. I used to carry an inhaler, and although I still own one for rescue purposes, I have rarely had to use it because I prophylactically use oils! We keep a small vial of pre-mixed oils that I rub on my chest twice a day when allergies are at their peak. Always make sure to check for sensitivity when applying essential oils to the skin. This blend can be rubbed on the chest and neck as needed to prevent breathing difficulties or help open up the respiratory passages. Rubbing the feet with diluted essential oils such as Peppermint, Thyme, Rosemary, or Frankincense can also help aid in relief. This can be done prior to bed or after a warm shower. Sometimes, when all else fails and my allergies are still bothering me, it is time to reach for extra tools. While I still increase my supplements like Berry Well when allergies strike, sometimes I just want to breathe and open up my nasal passages quickly. Enter the neti pot or similar nasal flushing device! I include sea salt and xylitol in my mix to help soothe my nasal passages. The salt helps to mimic the isotonic fluids present in the nasal passages and decreases irritation. Xylitol helps to eliminate germs and other toxins found in the nasal passages and makes it hostile for them to try to reestablish their reign. This can be used as needed throughout the day. Discard any leftover liquid at the end of each day, unless you add a few drops of Grapefruit Seed Extract to preserve the liquid. Mix well and use nasal washing device to administer as needed. While I still might have to wear that paper mask when I cut the grass, by watching my diet, supplementing vital nutrients, and using essential oils, I’ve found that my body is healthier and better equipped to handle the allergens that come my way. That’s been the key to achieving lasting allergy relief. Tal Ewing manages shipping and inventory for Beeyoutiful. He is married to our own Mary Ewing, and is the busy father of their five adorable children. He enjoys sports, outdoor activities, working in ministry opportunities as well as studying theology. He and Mary hope to soon have acreage where they can expand their backyard chickens into a small hobby farm! This article originally appeared in a slightly different format in our Spring 2013 catalog. Ma Ingalls and her girls gave their house a thorough scrub-down every spring.But if you’re like me, you’re exhausted at the mere thought of doing a Little House on the Prairie-style spring cleaning on top of the regular dishes and laundry. You may also wonder exactly why it seems so hard to accomplish the things on your to-do list. Do your hair and nails look as dragged out as you feel? Are seasonal allergies your excuse? Or maybe you’re pregnant and just counting down the months until you can feel like yourself again; who cares about clean windows anyway? Even if you’ve made great changes in favor of eating more nutrient-dense, whole foods, it also takes superfoods to help your body stay in top health. These days, pollution, stress, your past history of junky eating and pharmaceutical use all work against every glass of raw milk or organic veggies you consume. Superfoods, though, are super full of nutrition, and because they are nature-made, your body can easily absorb and use their goodness. So where do you start with adding superfoods to your diet? Which one will jumpstart your system and help you feel like washing windows after folding four loads of laundry, cooking for a crowd, and/or a long day at the office? Spirulina! This humble, algae-like plant (called a cyanobacteria) is one of the most potent protein and nutrient sources available. And boosting energy is just one of its many abilities. Spirulina also works to relieve congestion, sniffling, and sneezing caused by all types of allergies. It boosts the immune system, helps control high blood pressure and cholesterol, protects from cancer, and more. How does spirulina come by this impressive resume? As a source of protein, it is 65 percent complete protein. (By comparison, beef is only 22 percent complete.) This also makes it a far healthier choice than those much-touted, dubious protein powders, especially when you consider all the other hidden goodies you get with spirulina. Spirulina contains all the essential amino acids, plus some, and provides a healthy portion of Omega-3 (like in salmon) as well as Omega 6 and 9. Omega-6 is gamma linoleic acid (GLA), known to be anti-inflammatory (for arthritis relief! ), to increase fat burn after exercising, and to make beautiful hair and nails. Spirulina is replete with vital minerals most of those pretty veggies at the store can’t provide any more, thanks to being grown in depleted soils. Spirulina is high in chlorophyll, which removes toxins from the blood and boosts the immune system. Chlorophyll and iron are a great friend to pregnant mamas, as the tendency for anemia at this season of life is significant. That’s why spirulina is a main ingredient in Beeyoutiful’s SuperMom multivitamins. The easily absorbable, non-constipating iron content of spirulina is 58 times that of raw spinach and 28 times that of raw beef liver. If weeds get the best of your garden, or your kids (or you!) don’t like vegetables, or you simply wish you could juice but just can’t swing it, then handy, mineral-rich spirulina is the way to get your cancer-fighting daily quota of greens. Calcium and phosphorus are two of the major mineral players in this fantastic superfood. If these minerals are lacking or out of balance in the blood, tooth decay is in your near future. So spirulina is also recommended as part of a tooth remineralization program. And because the calcium content is more than 26 times that of milk, spirulina is excellent for children, the elderly, and pregnant women, and especially for folks who are casein- or lactose-intolerant. If your nerves are on edge or your digestion is off, you need spirulina for all the B complex vitamins it contains. The gut is our “second brain,” and it needs the B’s to work well. Do you have candida? Most people do these days, and spirulina has been shown to encourage and support the growth of healthy bacterial gut flora, which helps keep candida overgrowth under control. Because candida will cause and worsen symptoms, this is especially important if you have an autoimmune disease such as Crohn’s, chronic fatigue, lupus, or fibromyalgia. Yet another feature of spirulina is its ability to chelate arsenic from the body. Hair analysis on one of our daughters showed her to be loaded with arsenic, which mystified me until I learned of the many places she might have encountered it in her young life. Arsenic is often present in well water, in pressure-treated wood like that at playgrounds, and in insect and rodent poison (used in public places even if not at your house). In the past few years, news came out that it can be present even in rice, which especially impacts the gluten-free crowd. Yet the good news for my family was that after taking spirulina for six months, repeated tests showed the arsenic had cleared from my daughter’s body! Although the sixteenth-century Aztecs harvested and ate spirulina that grew wild in Mexico’s Lake Texcoco, spirulina is now often grown in protected, organic ponds. Spirulina from polluted sources can cause excess levels of lead, mercury, and cadmium in the body. Beeyoutiful does multiple-sample mass spectrometer testing on each and every batch harvested to assure that no environmental, pesticide or heavy metal contaminants are present in the end product they offer their customers. So you can have peace of mind knowing it is truly pure and safe! Spirulina does wonders for almost everyone, but if you are prone to gout, have hyperparathyroidism, PKU, or a seafood or iodine allergy, you should avoid it. Because it does have some carbs, you should also consult a physician before using spirulina if you have Type 2 diabetes. So how much spirulina do you need to get you going? A therapeutic serving size is between three and five grams, preferably broken up throughout the day. Since six tablets of Beeyoutiful’s Spirulina equal three grams, a bottle will last one person approximately one month. For more serious health conditions, take the higher amount, but build up slowly to this dose to avoid detox reactions. Once you re-energize with spirulina, you’ll be ready to tackle that makeover spring cleaning—and to give Ma Ingalls a run for her money! Nancy Webster is a mother of eight and leads the Southern Middle Tennessee chapter of the Weston A. Price Foundation. [LINK] Nancy and her family write online about their “partially working” farm where she is the resident researcher on nutrition and alternative approaches to good health. Thanks for joining us for Pregnancy Week! We’re wrapping up with some short videos from Steph about some of the supplements Mary’s written about over the past four days. Pour yourself a cup of tea and relax for a few moments, and enjoy spending some time with a friend talking about how to make pregnancy a healthy and pleasant experience!